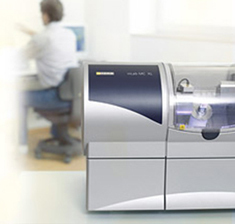 Dentistry has truly entered the 21st century with the amazing CEREC 3-D. CEREC 3-D is a CAD-CAM (Computer Aided Design – Computer Assisted Manufacturing) system specifically designed to manufacture accurate dental restorations of the highest quality. After decay and old filling material is removed, the individually manufactured ceramic will be fitted exactly. Depending on the severity, the whole procedure will take a couple hours. For more heavily compromised teeth, a traditional treatment is the crown restoration. Using our own CEREC method, crown restoration is completed in a single session. No temporary crowns, no impressions, and no need for a second injection. An expected treatment time of one to two hours is average. Malpositioned and discolored teeth may be restored with porcelain veneers. Your tooth is adjusted, while a thin layer of porcelain is bonded securely to your tooth. You’ll have your perfect look and perfect smile with just one session. Many dental restorations, such as inlays, onlays and crowns, require one or more visit, depending on the procedure. 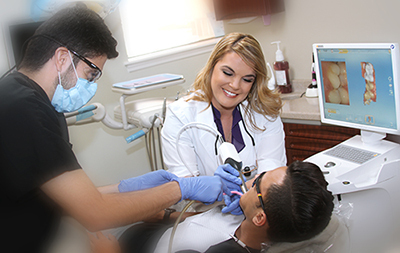 On the first visit, your tooth is prepared, an impression taken, and a temporary restoration placed on your tooth. The second appointment is made a couple of weeks later to have the temporary removed and the final restoration cemented. With CEREC 3-D, the procedure is done in a single appointment, start to finish. First, we examine your tooth and determines the appropriate treatment. It could be a simple filling, inlay, onlay or full crown, depending on how much healthy tooth structure is remaining. Next, we prepare your tooth for the restoration, removing decayed and weakened tooth tissue. This preparation is just like we would do for many other restorative techniques. Then, we take an Optical Impression of the prepared tooth. Instead of filling a tray with impression “goop” that you must bite into and hold in your mouth until it hardens, we coat your tooth with a non-toxic, tasteless powder. A camera is then used to take a digital picture of your tooth. This whole Optical Impression process only takes a minute or two. Next, the CEREC computer helps us create the restoration for your tooth. 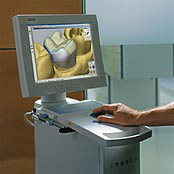 The CEREC 3-D software takes the digital picture and converts it into a 3-dimensional virtual model on the computer screen. We then use our dental expertise to design the restoration using the CEREC 3-D computer program. Within a few minutes, the restoration design data is sent to a separate milling machine in the office. A high quality ceramic block that matches your tooth shade is placed in the milling machine. About 10 – 20 minutes later, your all-ceramic, tooth-colored restoration is finished and ready for bonding to your tooth. Finally, we try the restoration in your mouth to ensure proper fit and bite. The restoration is then polished and bonded to the prepared tooth. Your tooth is restored with no “temporary” or return trip necessary. All of this is done in a single appointment. Dr Lauzan-Madruga has been approved by Sirona and Patterson Dental as an instructor for CEREC CAD/CAM training and regularly teaches other dentists this technique. To discover if CEREC 3-D restorations are right for you, call us for a consultation appointment.